"Teaching children to meditate might be as easy as herding any other group of frisky critters. 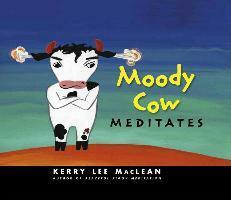 Moody Cow Meditates fills a distinct void in kid literature." --Publishers Weekly All of us, adults and children, struggle with 'Moody Cow' days sometimes, where we feel caught up in our anger and other emotions. This book is an accessible introduction to using mindfulness to find relief and calm. Kerry Lee MacLean is the author and illustrator of several award-winning and best-selling picture books, including Moody Cow Meditates and Peaceful Piggy Meditation. Her latest book is Moody Cow Learns Compassion, and her next will be an activity book for parents and children of all ages, The Family Meditation Workbook. Kerry has been leading family meditative arts workshops in North America, Australia and Europe for 15 years. She is the mother of five young adults who still employ meditation as an important tool in their busy lives.